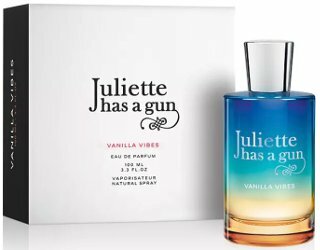 French niche line Juliette Has A Gun has launched Vanilla Vibes, a new fragrance inspired by Burning Man. Inspired by the electro and styling of the Burning Man Festival, Vanilla Vibes is the fusion of two opposites: an aphrodisiac natural Vanilla twisted with Sea Salt atmospheric vibes. The notes include fleur de sel, vanilla, orchid, sandalwood, tonka bean, brown musk and benzoin. Juliette Has A Gun Vanilla Vibes is available now at Bloomingdales, $135 for 100 ml Eau de Parfum. Very cute bottle…doesn’t sound as cute as the bottle though, but maybe. There is a lot about that ad copy to not like. Thead copy is ridiculous, but I look forward to smelling it, as a vanilla-lover. I hope Sephora has this specific one in-store. The JHAG offering at my local Sephora is anemic. Plus if Sephora gets it, you could use your vib discount! Yes! I’m accumulating a list of what I need (!) and will leverage the discount. I’ve been conditioned to wait for the discount! Ad copy written by someone that has clearly never smelled what Burning Man smells like. Might as well compare it to summer nights in NYC (aka hot garbage). And I’ve been to Afrika Burn,twice! (basically Burning Man,in the Tankwa desert in the Karoo in South Africa),so it will be cool to smell this. There’s always a hint of vanilla/sunscreen in the air at Afrika Burn,by the way! Look who the cat dragged in 😍😍😍 ? Lol. Not sure why it says California desert when it’s held in Nevada. Going to ignore the ad copy and wait impatiently to snif this. I’m on a vanilla roll so this might be my summer scent…. Oh my that ad copy is dismal, but the notes sound nice. And I like the bottle, too! I have smelled several “Burners” and the actual notes I would list are weed, dirt- encrusted b.o. and stale booze. Think Linus from Peanuts rather than electric vanilla. Usually you can smell a burner in the grocery line before you see them and it’s not a good smell. The only listed note that makes sense is brown musk…lol. Edit…I believe I meant Pigpen and not Linus from Peanuts..you get the idea lol.